We never imagined the colorful Milpitas Square across the street from our hotel would make for a fascinating culinary mini-trip. As empty nesters, we seize every opportunity to explore new places and connect with the people around us. Little did we know that an unconventional strip mall across the street from our hotel (Hampton by Hilton in Milpitas) would help make our Seekender visit to California that much more memorable. Milpitas happens to be the home of the second largest mall in the state, called the Great Mall, which is also the largest outlet mall in northern California. The city (in the center of the Silicon Valley) is probably best known, however, for housing the sprawling campuses of major tech firms like Cisco Systems and SanDisk. But if you enjoy Asian food and culture, you might want to take a detour from the big guys and visit Milpitas Square, a quirky Asian strip mall that’s a favorite lunchtime destination of the local tech cognoscenti. Honestly, after visiting Hong Kong, Shanghai, and Beijing several months ago, we felt as if we were visiting the Orient again. All the signage in Milpitas Square is in Chinese characters, illustrated with colorful graphic displays, and most shop owners are of Asian descent. According to a recent issue of Silicon Valley One World, more than 37 percent of Silicon Valley residents were born outside the United States, compared to 27 percent across California and 14 percent nationally. How lucky to be lodged right across the street, within walking distance of this unique destination with particular appeal to foodies! It was fun to stroll through the shopping center and see the diversity of restaurants and shops, some looking familiar and others less so. Milpitas Square is anchored by 99 Ranch Market, a huge Asian American supermarket chain with 36 stores, mostly in California with a few in Nevada, Washington and Texas. (99 is considered a lucky number in Chinese.) We had never been to one and I only wish there was an outpost closer to our home. The store features produce, meat and poultry, seafood and a bakery—but what was most tempting were the imported specialty products from around the world. We had never seen such a wide array of sakes and sauces. Also appealing was the mouth-watering deli counter with sushi, Cantonese roast duck, barbecued pork, other cooked Chinese and Taiwanese dishes and dim sum. We had limited space in our suitcases but picked up some small dishes for soy sauce as souvenirs. The number of different restaurants, teashops, and health food and jewelry stores was totally amazing. There was also an inviting foot spa located in the mall (presumably for those on diets). At lunchtime each day, the vast parking lot was filled to capacity with workers from nearby companies with corporate badges hanging from their belts. We didn’t know which restaurant to select for our lunch among those offering Indian, Vietnamese, Cambodian, Thai, Malaysian, or Chinese cuisines. We randomly chose a wonderful place for lunch, called My Dumplings, where of course, we sampled a variety of beef, pork and vegan dumplings that came in old-fashioned bamboo steamers. They were so hot that they fogged up my iPhone camera but they were absolutely delicious. 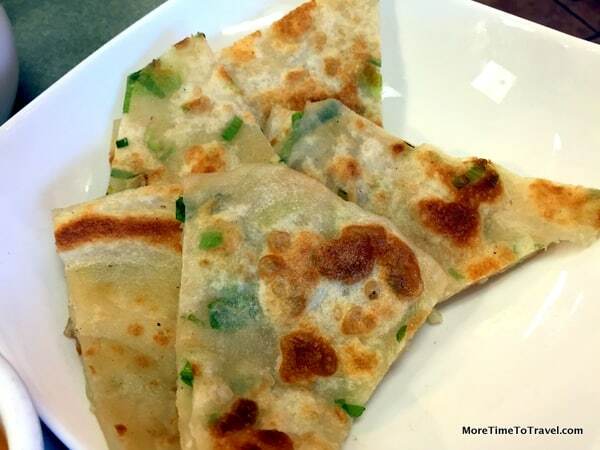 We also loved the perfectly browned scallion pancakes and complimentary tea for the table. After lunch, we made a beeline for the Sheng Kee Bakery, a famous Taiwanese bakery that has multiple stores in the Bay area. We were smitten by the beautiful cake displays and couldn’t help but sample some cookies and sliced cakes before we left. While in Milpitas, our weekend culinary forays here and in other nearby towns also included Japanese, Greek, Italian, and Chinese foods. But this fascinating shopping center will surely capture the fancy of any culinary traveler. We hope to return again and sample a few of the food emporiums we missed. The trip from New York to California is long but not as long as the one to China! Disclosure: As a member of the Seekender team, my weekend getaway to the Silicon Valley was sponsored by Hampton by Hilton but all opinions expressed in this post are my own. It’s been a long time since I’ve been in Milpitas. I’ve probably only passed through briefly since the days when I worked in San Jose. What wonderful Asian culinary gems you found there. Might be time for my return visit. We visited San Jose, too. I imagine it’s changed since you worked there…so much development and the light railway. My decidedly low tech sister lives in Milpitas with her family. The first place they took us for dinner was their favorite Vietnamese restaurant for pho. I love Vietnamese food! On this same trip, we went to a wonderful Vietnamese restaurant in Sunnyvale called Pho Lovers. Everything looks delicious. I never realized that the Chinese considered 99 a lucky number. Here in Korea we call that pancake pajeon, and it is delicious.